Tennis courts have an iconic appearance: The lines on the ground, the net through the middle, and the chain-link fence surrounding the field of play. The lines and the net are standard and are what make a tennis court a tennis court, but why is it always chain-link fencing? The reason is because chain link has several qualities that make it ideally suited for bordering the nation’s games. Although all fencing, for obvious reasons, needs to be able to withstand the elements, chain link needs far less maintenance than, say, wood. This makes it ideal for commercial or public courts. A tennis court’s fence also has to be able to withstand impacts from tennis balls—lots of impacts, some striking with impressive force. Chain link can do this job perfectly and never splinters, chips, or cracks. A tennis net is going to be strung up using the fence posts, which means anything that pulls, tugs, or falls onto the net is going to potentially affect the fence. 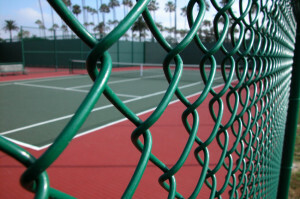 Chain-link fences are regularly built with top rails to prevent sagging and can be designed to accommodate net attachments for both tennis and other sports. Also, chain-link fences can be designed to have more “give” or “bounce” than other materials, allowing for minimal injury or damage to the fence itself if an overenthusiastic player makes a collision. Chain link is much less labour-intensive to set up than other forms of fencing, and it is also a simpler matter to repair. This means less downtime, more fun on the court, and lower costs. Total Fence Inc. offers experienced, professional chain-link fence installation for tennis courts and many other applications. We offer heights ranging from 3 1/2 feet to 12 feet, with mesh that can be tailored to the unique needs of each project. For tennis courts that want to take a more stylistic approach but still enjoy the functionality benefits of chain link, we also offer ornamental fencing and colour-coated chain-link mesh. We have spent years serving the fencing needs of the Greater Toronto Area, and there is very little we have not seen or installed before. This means that when you hire Total Fence Inc. for your tennis court’s chain-link fence, you get tried-and-true service that can give you the fence you want in the time you need. We take pride in our work and respond quickly in the event that repairs are needed, so you never have to fear being left in the lurch. Our fencing experts can even walk you through the ins and outs of chain-link maintenance so you know the best way to keep your tennis fence in shape. Contact us at 416-239-5362 to speak with a consultant and learn about how we can make your tennis court the best chain link possible.